Last weekend was a busy one for the UK club racing scene, with North Gloucester, Darley Moor and the CMRC all hosting their final rounds of the 2018 season. Also in action were the BEMSEE paddock, who made a final trip of the year to Brands Hatch on the super-fast Indy Circuit, with several championship title fights going right down to the wire. The weather refused to play ball during long spells of the meeting, which resulted in much swapping of wheels, and this was reflected in the sales of ContiRaceAttack Rain tyres from our official outlet in the lower paddock. With no 160-section wet rear currently available, sadly Continental wasn’t an option for MRO Minitwin title contender Dan Singleton during Saturday’s races, but with a dry track on the Sunday it was business as usual for the former rookie champion. With fellow title challenger Mason Williams sadly unable to race following a Saturday crash, the title looked like Dan’s to lose, barring any moments of technical troubles. Two second placed finishes behind Keith Povah ensured that Singleton secured enough points to overhaul Williams lead and take the title at the second time of asking. Dan Harris and Wil Green would also go on to secure solid championship positions in their first year outside of the rookie class. The last three Rookie Minitwin titles have now all been claimed by riders on ContiRaceAttack Comp rubber, with Cam Harris and Charlie Crawt following in Dan’s footsteps and storming to victory in 2017 and 2018 respectively. 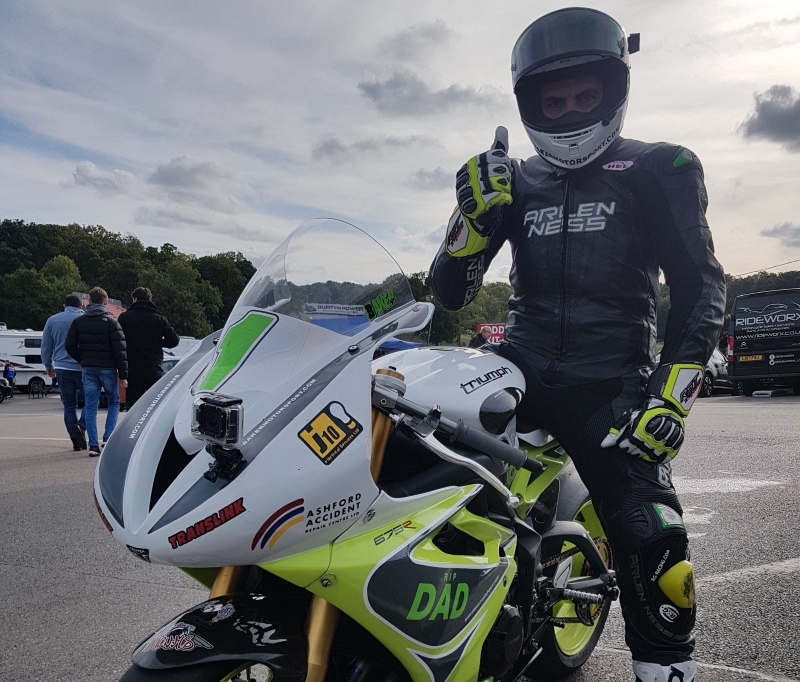 In the Clubman 600 class, Phil Baker had already secured the title heading into Brands Hatch, and he decided to test out our German-made race rubber on his Daytona. After using the ContiRaceAttack Rain on Saturday, he came back on Sunday for a set of ContiTrack Slicks as he went on to take two podiums over the weekend. The Rookie Thunderbike Sport title had already been put to bed with no racing at the weekend, with Shane Beasley’s 10-race winning streak helping him to dominate that class this season. Thunderbike Extreme Rookie Robert Breen would also go on to cap off his great year with a trio of wins to further extend his already unassailable championship lead. Last season the title was claimed by Ande Friend on Continental tyres. Riders will now have to wait until 10th November and the club’s annual dinner and dance to get their hands on their respective trophies. Congratulations to all the riders involved with BEMSEE this season on some fantastic racing across ten action packed rounds. This entry was posted in News and tagged ContiRaceAttack Comp, ContiRaceAttack Rain, ContiTrack Slick, Racing. Bookmark the permalink.